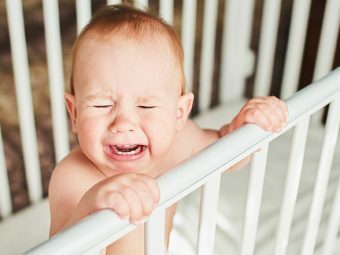 What is a baby’s sleep schedule between 4 and 6 months? What can you expect from the baby’s sleeping style? Why does the baby wake up during the sleep? 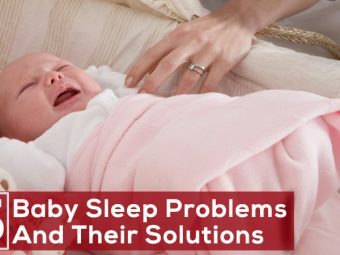 What are some sleep problems displayed by the baby? How to help the baby fall asleep? Sleep is vital for the baby’s growth. Be it a newborn or an older infant, your little one will spend a significant chunk of the day snoozing in the crib. As the baby grows, the sleep schedule also changes. In this article, MomJunction gives you all the information you need about a four to six-month-old baby’s sleep patterns. What Is A Baby’s Sleep Schedule Between four and six Months? At this age, the baby’s daytime sleeping hours could increase or decrease by an hour. So at four months, a baby may sleep for 10 hours at night, while that could increase to 11 hours by six months. What Can You Expect From The Baby’s Sleeping Style Between 4-6 Months? 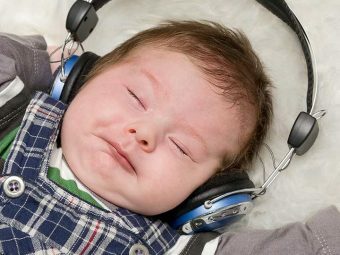 Increased nighttime sleeping: The baby would develop a preference for night time sleep by the age of four months. Daytime naps: The daytime sleeping hours are divided through the day, into two or more nap sessions. Sleeping through the night: By the time your baby is six months old, they can go about 5-6 hours without a feed during the night. Early riser: Babies in this age group may rise early in the morning and tend to coo, gurgle, or cry for a feed. Some babies may wake up more often than you expect, making it difficult for you to have a good night’s sleep. A baby can wake up in the middle of the night or during daytime naps if they have teething pain, soiled diapers, or feel hungry. If none of these issues are the reason, then you can consider doing the following things (3). Let the baby fuss for some time: If the baby is fussy, allow them a chance to calm down on their own. This teaches self-pacification, is a vital skill that the baby should learn. Check for disturbances: If the baby wakes up in the middle of a nap, then try looking for things that could be causing discomfort to the baby. Maybe the room is colder, or it is too dark for the baby’s comfort, or there is too much light disturbing the baby. Check for any such issues and address them right away. Reassure the baby: Say a few words of comfort and place on your hand on the baby to help them sleep. Pediatric experts state that waking up during the night is common at the age of six months (4). A major reason is separation anxiety, which is typical at this age. The baby also undergoes a growth spurt at the age of six months, which could cause sleep regression and the baby waking up for frequent feeds at night (5). Nevertheless, this growing phase would pass soon. But there could be other reasons preventing the baby from sleeping at this age. Displaying extreme sleep regression and waking up several times during the night, even though they had slept calmly through the nights before. Does not go to sleep if the parent is not close by. Crying or throwing a tantrum when the parent leaves the room. Can fall asleep only when the parents hold him. If you are not sure what’s keeping your baby up, consult a doctor who can detect the underlying problem or suggest some sleep training methods to help the baby fall asleep. Have naps and bedtime at the same time every day: Ensuring the baby has a daytime nap at the same time every day forms a routine. Putting the baby to bed at precisely the same time also means the baby will feel sleepy at the same time every night, thus making it easier for them to fall asleep. Implement a bedtime routine: Have a routine before you put the baby to bed at night. Bath the baby or read them a story, before placing them in their crib. It helps the baby know that it is time to settle in for the night. Avoid activity before bedtime or before naps: Avoid any fun activity or game right before it is time for the baby to sleep. It can excite the baby and make it difficult for them to fall asleep. 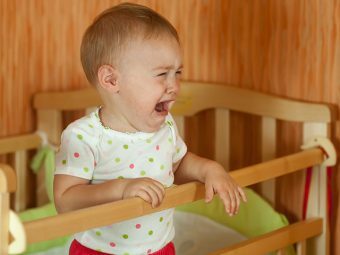 Put the baby to bed when drowsy: Instead of waiting for the baby to get exhausted to sleep, put the baby in the crib when they show the signs of sleepiness such as yawning, dozing, rubbing eyes, and being fussy. Babies who are completely exhausted can act fussy and have trouble falling asleep. Reassure baby when they cry but do not lift them out: When the baby wakes in the middle of a nap, reassure them with a pat and soft words, but never pick them up and cuddle. If you do, the baby will associate your attention with crying and may learn to cry just to be lifted out of the crib. This can become a hard habit to break, and the baby may continue crying until they are cuddled. Like eating and playing, sleep is essential for a baby’s growth. The baby’s sleep habits continue to change through the first year. Four to six months is when the baby learns to sleep more at night, a habit you should help them develop to set a sleeping pattern. If the baby has difficulty sleeping for reasons you do not understand, talk to a doctor. How was your baby’s sleep pattern at the age of four to six months? Tell us about your experience in the comments section. Baby Sleeping On Stomach: When Is It Safe And What Are The Risks?